According to Hinduism the entire physical existence is a combination of physical elements. These five elements are known as Pancha Bhootas. The five elements are Prithvi (Earth i.e the solid state), Aakaash (Space / Ether), Agni (Fire), Jal / Neer (Water i.e the liquid state) and Vaayu (Air i.e the gaseous state) - the states of matter according to science. Lord Shiva is believed to manifest Himself in 5 different elements in the Lingam form. There are five Shiva temples in South India that are dedicated to Pancha Bhoota Lingams and are known as Pancha Bhoota Sthalams. These five places are considered Holy for Shaivites and these temples are heavily crowded with devotees on Maha Sivaratri day. There is one Pancha Bhoota Shivalinga temple in Andhra Pradesh while the rest of the four temples are in Tamil Nadu. 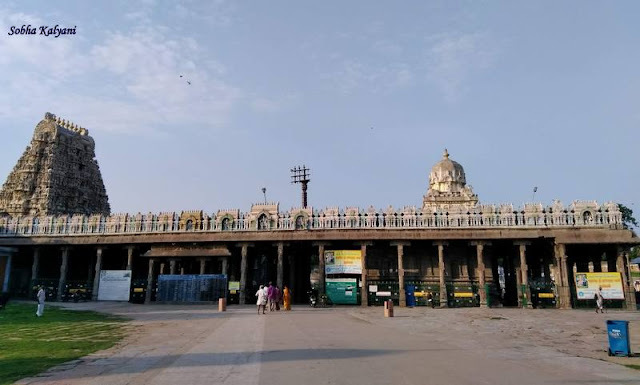 Ekamreswara / Ekambareswara temple in Kancheepuram (also known as Shiva Kanchi) is located in Tamil Nadu. Kancheepuram is at a distance of around 70 Km from Chennai. The main deity, Ekambareswara represents Earth and is in Prithvi Lingam form. The temple was rebuilt by the Pallava Kings, Cholas and Vijayanagara Kings. It dates back to 600 C.E (Current Era). The temple is very spacious with inscriptions in Telugu language in old Telugu script on the stones. There is a 3,500 years old mango tree in the temple which is considered highly sacred. There is a belief that Goddess Parvati Devi (Siva's wife) installed the Lingam under the shade of this oldest mango tree. In the temple, it is Pradhiva Lingami.e made of Earth (soil), 'abhishekams' (i.e pouring of water / liquids) are not performed to the Lingam here. The Raja Gopuram i.e the tower of the main entrance gate is one of the tallest one in India. It has 11 storeys with beautiful sculptures. Goddess Parvati Devi resides in Kancheepuram in the form of Kamakshi Devi which is one of the Ashtadasa (18) Shakti Peethams. Jambukeswara temple is located in Tiruchirapalli (Trichy) in Tamil Nadu. Due to the popularity of the temple, the place is also known as Jambukeswaram. Lord Shiva is known as Abhisheka Priya i.e the one who is fond of 'abhishekams'. The Jala Lingam in this temple is immersed in pool of water. In this temple Goddess Parvati Devi is worshiped as Akhilandeswari.. It is said that Lord Siva meditated under the Jamun tree here, hence known as Jambukeswara. The temple is very spacious with tall gopurams i.e towers. As per the mention in the legends, Lord Siva has evolved in the form of Agni Lingam on Mahasivaratri night. Arunachalam also known as Tiruannamalai gained popularity as Siva Lingam in this temple is in the form of Agni. As per sthala puranam i.e legend of the place, it is said that to settle the dispute between Lord Vishnu and Brahma, Siva took the form of Tejo Lingam at this place. Parvati Devi is worshiped in the named of Apeetakuchalamba Devi in this temple. It is a large temple complex. Kartika Masam is specially celebrated in this temple with specially lit Kartika Deepam. The temple is heavily crowded with devotees to see the oil lit lamp. Many devotees do giri pradakshina i.e going round the sacred hill. Sri Kalahasti in Andhra Pradesh is located near Tirumala-Tirupati. It is on the bank of River Swarnamukhi. Sri Kalahastiwara is in the form of Vayu Lingam in this temple. One can see the moving flames of the oil lit lamps inside the garbhalaya i.e sanctum sanctorum. The flames of oil lit lamp keep moving due to the wind that comes from the hollow lingam which confirms that it a Vayu lingam. In this temple Parvati Devi is worshiped as Sri Gyana Prasunamba. Pilgrims from Tirumala, compulsorily visit this place as it is believed that visiting the temple is equivalent to visiting Kailash - the abode of Lord Siva. The temple gained popularity for Rahu-Ketu pooja specially performed to get rid of doshas. This is the only temple in India that remains open even during Grahan / eclipse time. In Nataraja temple in Chidambaram, Lord Siva is in Aananda Tandava pose i.e in dance pose in Cosmic Bliss. Behind the idol of Nataraj is the Akasa Lingam. There is a curtain which is raised for a fraction of a second by the temple priest after the pooja. Devotees can only see the hanging garland of bilwa leaves which keep moving due to the wind. It is said that there is no lingam but the devotees are made to believe that there is Akasa lingam that is invisible. In this temple, Parvati Devi is worshiped as Sivakama Sundari. The temple architecture here is awesome. These five famous Siva temples together make the Pancha Bhoota Sthalam temple. A visit to these temples makes one spiritually elevated.